Established in 1985 by a group of residents concerned about the lack of funding for local organizations, the Richland Wilkin Community Foundation (formerly the Breckenridge/Wahpeton Community Foundation) provides a method of receiving funds/donations to benefit projects or nonprofit organizations in Richland County in ND and Wilkin County in MN. The Richland Wilkin Community Foundation is affiliated with the North Dakota Community Foundation, which is a nonprofit, tax-exempt corporation under IRS code 501(C)3 and North Dakota State law. Mission Statement: To promote philanthropy and charitable giving that will impact the success of innovative, creative approaches to community growth and well-being. 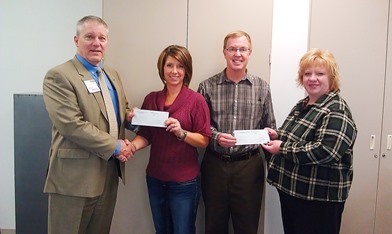 Breckenridge/Wahpeton Community Foundation board members John Richman (far left) and Collette Barton (far right) award grants to successful applicants in 2011.
or contact Amy Stromsodt at the North Dakota Community Foundation. The Breckenridge/Wahpeton Community Foundation has changed its name to the Richland Wilkin Community Foundation to better reflect its area of service. A new logo has also been developed to coincide with the name change. • Grants shall not be made to individuals. Organizations authorized under IRS code 501(c)3 and those with official ties to government entities will be accepted. • Grants shall be awarded to organizations within Richland County in ND and Wilkin County in MN. • Grants generally do not exceed $1500.00. • Grants must have a significant impact on the financial success of the project. To this end, requests should not be a minor percentage of a much larger budget. • Lower priority will be given to projects supported by government, or which in the board’s opinion should be funded by tax collections. Some of the 2014 grant recipients received their grants from BWCF board members in January of 2015. Pictured back row left to right are: BWCF board members Ken Harty & John Richman, Wyndmere park board member Mark Brekken. Front row left to right: Red Door Art Gallery manager Jolene Miller, BWCF board member Jana Berndt, Twin Town Skate Park member Sawyer Schuler, BWCF board member Colette Barton & Wydmere park board member Darcy Heitkamp. Our thanks to the Wahpeton Daily News for the photo. Burton Louis Gewalt Meritorious Scholarship: The Burton Louis Gewalt Meritorious Fund was established with a gift from the estate of Burton Gewalt who passed away in 2009. 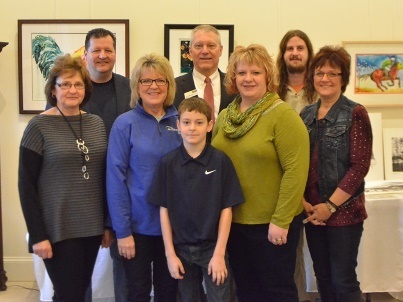 The Burton Louis Gewalt Meritorious Fund will provide scholarship assistance to deserving students who have graduated from Breckenridge, MN High School. Dr. Roger E. Meisner Veterinary Medicine Educational Fund: Established in 1996 by Dr. Roger E. Meisner who practiced Veterinary Medicine in the Wahpeton area and who also worked for the Federal Government for a number of years. Applicants must be graduates from a North Dakota high school and have been accepted or actively enrolled in a Professional School of any accredited College of Veterinary medicine in North America. Elmer & Lucille Hoffert Fund: Established in 2004 to support charitable projects in the Breckenridge/Wahpeton area. Elmer & Lucille Hoffert Medical Research Fund: Established in 2004 to support cancer and heart disease research.